Australia Day Brisbane is a Summer Day of January 26 in the Queensland capital city. 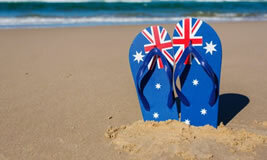 Summer in Queensland is always good so to add a Australia Day public holiday is a fabulous bonus. The Brisbane River meanders thru Brisbane so you can always be close to the water where ever you go in Brisbane. And there are plenty of ideas for Australia day events at venues either close in the CBD around the SouthBank area or out a little towards Fortitude Valley party scene or even further out in the suburbs. Australia Day is about getting together with friends and family and enjoying everything that we Australian's enjoy this great country for. 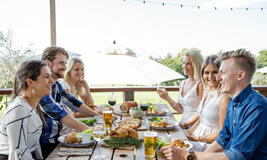 So make sure you plan to get together enjoy with family and friends and we have some great venues and awesome ideas around Brisbane just for you. Happy Australia Day Brisbane. Brisbane's Australia Day celebrations are all about friends and family and getting together. Enjoy your Australia Day. 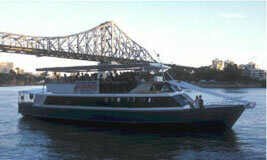 No better place to enjoy Australia Day in Brisbane than on a great boat on the Brisbane River. Sail Australia has some fabulous powered and sailing options. Can you think of a better way to celebrate with family and/or friends on Australia Day than a cruise on the Brisbane River? Enjoy and Aussie meal this Australia Day at Victoria Park. It'll be fun for the whole family with loads of activities for the Kids including sack races and jumping castles. So celebrate Australia Day with a fun day out at Victoria Park. Make a Lunch Booking Today! Celebrate Australia Day with a selection of the best cold beers at Brewhouse Brisbane. Get into the spirt and enjoy an Aussie Burger. Return the next day for the Triple J Hottest 100 countdown, plus free pool and big buck. Australia Day BBQ's are the essential idea for 26th Jan celebrations. Then it is a matter of just building the idea around that. Why not have some friends over for a Australia Day BBQ Breakfast! And get some gorgeous seafood like morton bay bugs to fire it up. Enjoy your Australia Day Brisbane! Love is in the air come February and Valentine's Day in Brisbane is the next Big Day of the Summer. For lovers and couples go on, do something romantic.